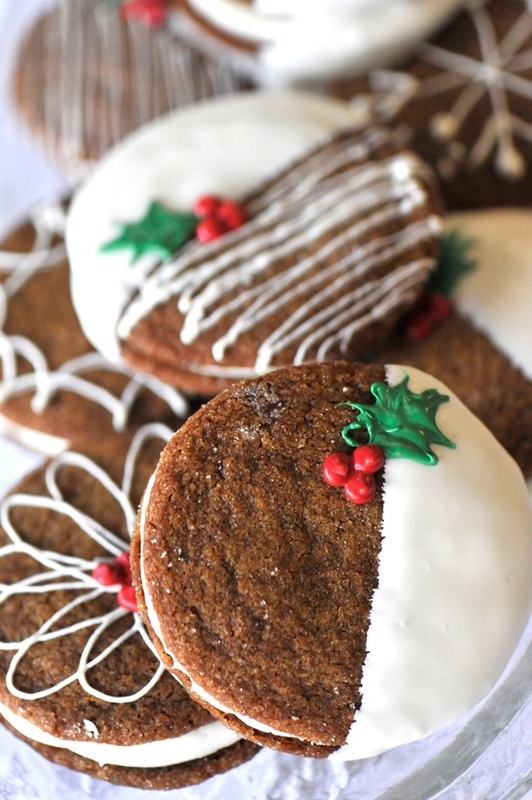 This is a really simple idea for a Christmas treat. Decorate the ginger creams with dipped white chocolate and icing writing holly leaves, pop in cute bags with Christmas ribbon and boom – Christmas treats, done. 1. Mix butter, sugar, egg, treacle and water thoroughly. Sift together flour, 1/2 teaspoon salt, bicarbonate of soda and spices and blend in. Chill dough until firm. 2. Preheat oven to 200 C / Gas Mark 6. 3. Drop dough by teaspoonfuls about 5cm (2 in) apart on lightly greased baking tray. Bake about 8 minutes, or until almost no imprint remains when touched lightly. While slightly warm, cover with icing. 4. To make icing: Blend icing sugar, 1/4 teaspoon salt and 1/2 teaspoon vanilla. Add cream to make icing easy to spread. Spread on the biscuits with a plastic spatula. 5. Melt some white chocolate in short bursts in the microwave, and dip the biscuits in the melted chocolate. Leave to cool. Once cooled, decorate with writing icing.